Instantly clean your mailing list addresses to ensure deliverability. Follow the United States Postal Service (USPS) Coding Accuracy Support System (CASS) standards to correct and validate mailing addresses, add missing address information to ensure the address is complete, and perform Delivery Point Validation (DPV) coding. Speed-to-market and information accuracy are critical to your marketing campaign’s success. The UpdateYourList.com DIY Portal allows you to instantly clean and validate the mailing addresses for your customer and prospect files in real-time to get the most out of your contact records. Our Address Standardization services utilize the USPS Coding Accuracy Support System (CASS) requirements to correct and standardize addresses, add missing information, and process Delivery Point Validation (DPV). What is Coding Accuracy Support System (CASS) processing? Coding Accuracy Support System (CASS) is a certification system from the United States Postal Service (USPS) for address validation. Our CASS-certified address validation service standardizes your mailing lists, updates outdated addresses, and verifies that your addresses are valid and complete. The DIY Portal instantly standardizes, corrects, updates, and verfies the addresses in your file and returns your file in minutes. 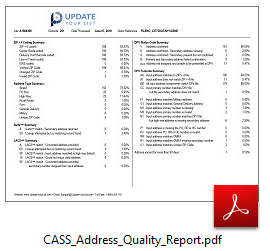 Why should I use Coding Accuracy Support System (CASS) address standardization? Maximize address quality, minimize mailing cost. Delivery information is only as good as the quality of the address data. Our goal is to help customers send their mail to the correct address every time. CASS address standardization provides added product value and service offerings that enable our customers to better manage the quality of their mailing lists while maximizing the ability to deliver mail as addressed. Can I save money with CASS standardized data? Yes! Ensuring every mail piece you send is deliverable, means you will not waste money for returned pieces or mail sent to a vacant address. Also, by using CASS address standardization you may qualify for postage discounts for every single mail piece when pre-sorting the mail for the USPS. What is the DIY Portal turn-around time for CASS Address Standardization processing? When opting for real-time processing, the DIY Portal can process thousands of records per minute, and files are returned within minutes or hours based on the total record count. 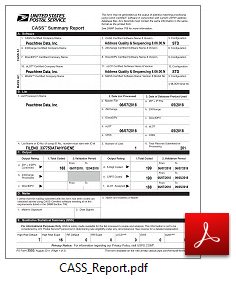 How much does Address Standardization (CASS) cost? It only costs $1.30 for every 1,000 input records, or $0.0013 per record. For less than a penny a record the cost for processing is easily recovered when you're not sending undeliverable mail. 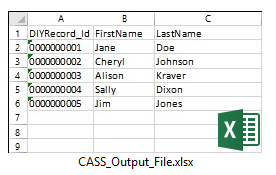 What data elements are returned in my file when I process CASS address standardization? 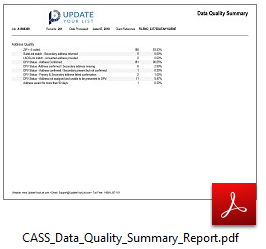 Download our CASS_Ouput_File.xlsx sample file to see sample data that is returned. 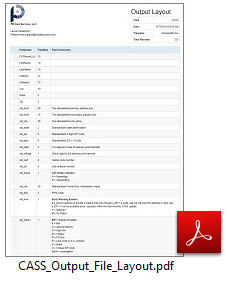 Download our CASS_Ouput_File_Layout.pdf that explains the layout and data dictionary for all of the fields and elements returned. Is CASS address standardization available through your API? Yes! In our API adress standardization is known as Address Cleanse.